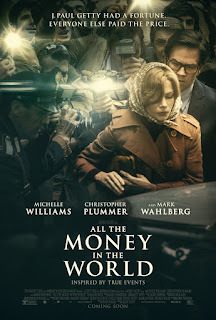 Christopher Plummer plays J. Paul Getty, the world's richest man in "All the Money in the World." The story is suggested by the real life kidnapping of Getty's grandson in the 1970s. Getty's daughter-in-law (played by Michelle Williams) appeals to the billionaire for millions to pay the ransom. She's broke, thanks to a lack of financial support from Getty's drug addict son. The old man refuses to pay, channeling his inner Scrooge, even as his grandson's life hangs in the balance. Mark Wahlberg appears as Getty's fixer, working with Williams for a resolution. "All the Money in the World" is getting a lot of attention because Kevin Spacey, originally cast at Getty, was cut out of the movie after shooting. Plummer shot his role in the last few weeks. Christopher Plummer's the right age, with the right amount of bitterness. "All the Money in the World" feels long, but has some stellar moments. "All the Money in the World," rated "R," 2½ stars. Does it deliver what it promises? Real life drama. Is it entertaining? Plummer's great. Is it worth the price of admission? Not bad.